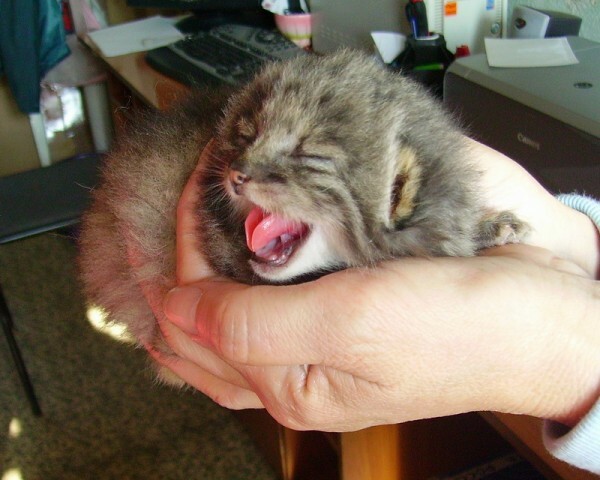 When a Russian farmer was doing the rounds on his property, he discovered what he thought were four tiny kittens in his barn, of the like that he’d never seen before. 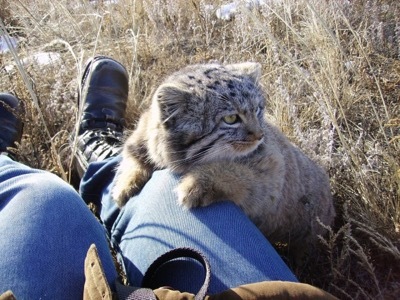 He knew that they weren’t our regular domestic kitties and being unable to identify them he contacted the Daursky Nature Reserve for help and advice. When he found the four kittens, they still had their eyes closed, he knew they would need a lot of help if they were going to survive. 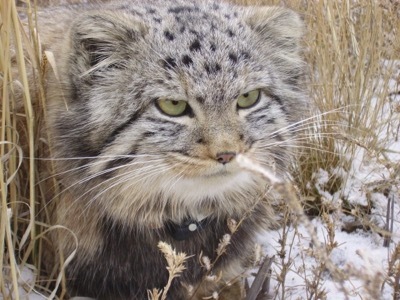 The Daursky Nature Reserve identified the kittens as Pallas’s cats, also known as Manuls, a rare species wild cat found in Central Asia. 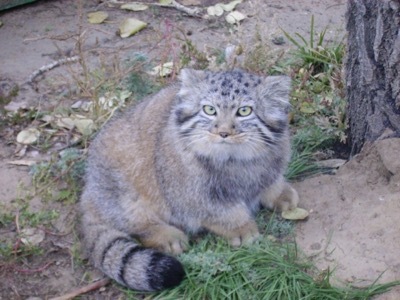 Manuls are about the same size as domestic cats but are much stockier, with shorter legs and a wider face with flattened ears. 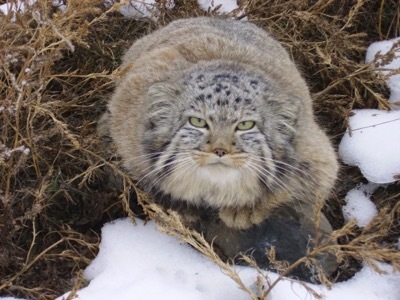 They have a thick coat of fur which helps them survive the harsh climate in their native lands. 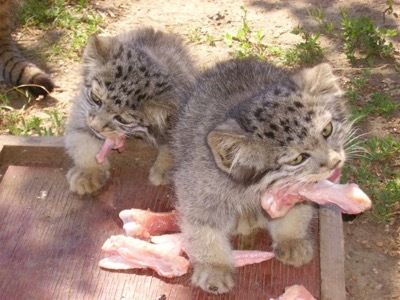 After being taken to the reserve, the kittens were placed with two domestic cats who immediately took them on as their own, saving their lives. The staff at the reserve had become very found of these kittens that were now flourishing but they knew the time was approaching to release them back into the wild where they belonged. During their first winter alone in the wild, the Manuls lost the radio collars that the reserve put on them to track their progress. They had also lost a lot of weight. 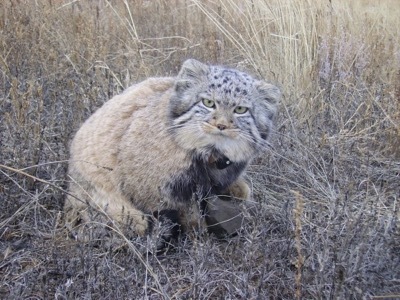 The staff thought the best thing to do was to bring them back to the reserve where they would live out the winter and re-release them back in the wild in springtime when they would have more chance of survival. This was the right thing to do as the Manuls soon acclimatised to their new surroundings. 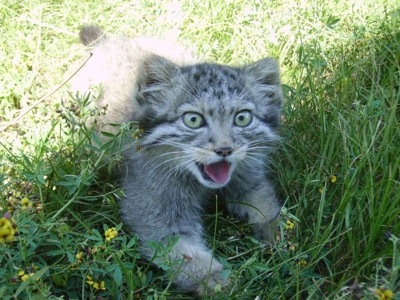 These beautiful wild cats are now back in the wild where they belong and are thriving!